My partner and I resolved six weeks ago to take up hiking every Sunday. We were babysitting my sister’s dogs, and they needed to be exhausted every night, and we were tired of going to the same three parks to run them. We decided that for ourselves, we would go hiking every Sunday, and if we were going to be busy on Sunday we’d go Thursday, so long as we went every week. Six weeks later, we haven’t missed a week! We won’t have the dogs next week to come with us, but we’ve really enjoyed getting out and going for a hike through this incredible Canadian landscape. I’m always shocked how few people we meet along our way – it’s just us, in the bush, enjoying the perfection of lakes and forests and the feel of roots and rocks underfoot. Heaven. I think, slowly, alongside this new commitment to one physical activity every week, I’m starting to lose weight and feel fit. It keeps me thinking about health and good things, rather than getting bogged down in the unhealthy lifestyle that comes with vegging in front of a computer screen. We’ve decided that since this one goal has become a habit that we both enjoy and will continue throughout the winter, we are going to compound our good decisions by adding a few new ones. He’s agreed to take a Latin/Ballroom class with me this fall, so I’m signing us up for one in the “big” city nearby. I suspect that we’ll turn that night into a date night – maybe appetizers and drinks before or after our lesson. Nothing wrong with building romance into your week! And finally, I’m going to work on two separate goals for myself. I want to start taking a yoga class every week somewhere – preferrably on Mondays so that I can work the kinks out after my hike – and I’m also going to start going to a spin class at the Y near our place. I want to do a lot of skiing this winter, and it’s so much easier if your legs are conditioned ahead of time. Spinning is such a great way to get those muscles – and my knees – ready for the BC slopes. Four planned physical activities every week should be a nice switch from none. I’m expecting to feel really sore, and then really good. I’m signing up for the dance class and the yoga class ahead of time so that it comes as a pre-planned activity, which will help incorporate it into a routine. Finally, I’ve decided to give myself one other modest goal. All of the goals I’ve ever made to eliminate sugar forever and becoming instantly healthier have failed. However, when I give myself a specific and limited scope to the goal, such as doing a cleanse, I’m more successful. And the long-term effects seem positive because I discover new things to cook and new ways to make sure I eat well when I’m out and about. Therefore, I’ve decided that three months of the year will be my “clean” months. I’ve chosen the most common months to want to start a new routine – September, January, and May. In these months, I’m generally giving myself the rule “Don’t eat junk food”. If I know it to be “junk food”, I won’t eat it. This includes pretty much all refined sugar and flour, chips, fries, fast food, candy, pop, ice cream, processed meat, and processed cheese. No more Cracker Barrel for me. We’re all stocked up on good quality locally-produced aged cheddar, and healthy meats from the local organic food store. 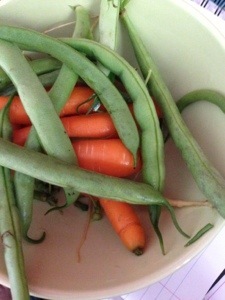 I went out to my garden this morning and pulled up a huge handful of carrots, cherry tomatoes, and beans. I’m sitting here eating them like candy. Carrots straight out of the ground are nothing like carrots in the grocery store. They are so much sweeter. I feel good about these changes because while they are strong changes, they aren’t drastic or unsustainable. I know that I’m never going to eat clean in December, so I will make sure January is a nice cleanse-based month with lots of restorative winter vegetables on menu. September is so easy to eat clean because it’s harvest month and the vegetables taste better than junk anyway. And May is all about rolling into summer and starting to crave clean, summer foods. I’m pleased with this plan. It’s do-able. I’m also really expecting the positive habits developed in these months to spill over into the other months. And I will work on my plan for that toward the end of September. For now, I’m excited about our new activities. I’m excited about my firm thigh muscles developing under my hiking pants. And I’m excited about the 5 lbs that slid off the scale this week even as it’s that time of the month where I’m usually the heaviest. And I friggin’ love these carrots! Seriously, next year, you should plant carrots. They’re so good.